Democrats are fielding more women and minority candidates than ever, while Republicans are trying to hold their majority with mostly white men. Where are the Republicans with a conscience? Perhaps nowhere is the choice facing voters on Tuesday more vividly on display than in the battle for control of the US House. Democrats are fielding more women and minority candidates than ever, while Republicans are trying to hold their majority with mostly white men. The disparity highlights a trend that has been amplified under US President Donald Trump, with the two parties increasingly polarised along gender and racial lines as much as by issues. The result is that, in an election season playing out against the backdrop of bomb threats, violence and a charged immigration debate, the parties are presenting voters starkly different pictures of US leadership. Democrats have nominated more than 180 female candidates for the House, a record. But while voters could send more than 100 of them to victory, Republicans could have fewer women than now in their ranks next year due to retirements and tough races, according to election analysts. Overall, nearly 9 in 10 House Republicans will be white men when the new Congress convenes in January. The racial divide is even starker. House Republicans now count just over a dozen minority members, a number that's not expected to change much after the election. The lack of minorities in the conference comes into sharp visual focus when House Republicans gather in a large group, as they did last December when they celebrated the passage of tax cuts with Trump at the White House. Meanwhile, African-American, Latino and Asian-American lawmakers make up almost half the House Democratic caucus. And for the first time, less than half the Democratic candidates for the House are white men, and the Democrats are poised to send the first Native American and Muslim-American women to the House. It's what the Reflective Democracy Campaign calls a "historic shift." 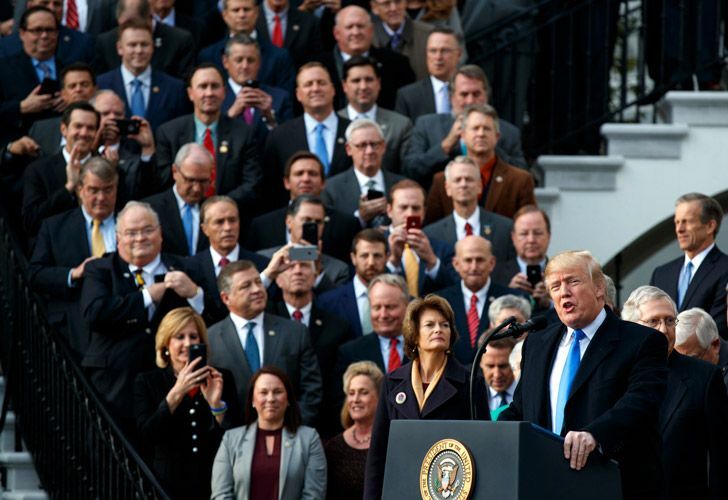 After Tuesday's election, it's likely that 87 percent of Republicans in the House will be white men, compared with just 37 percent for Democrats, said David Wasserman, who analyses races for the Cook Political Report. Marc Hetherington, a professor of political science at the University of North Carolina at Chapel Hill, said the trend began long before this year's election. "There's a relatively easy explanation — the Republican Party over the past 20 years has become the party of white men," he said. At the same time, "Democrats have come to be seen as the party of minorities." Political scientists have been debating whether Congress' low approval rating — now 21 percent — has something to do with lawmakers not seeming to reflect the country they represent, said Matt Barreto, a professor at UCLA who is also a pollster working to mobilise 'Latino' voters this cycle. Overall, while the House is closer to reflecting the makeup of the country, which is still majority white, the representation is lopsided between the parties. "Everyone wants a representative from their community to stand up for their issues," Barreto said. For the House, he said, "It's the entire point: They're representatives." Democrats need a net gain of 23 seats to win back the House in Tuesday's election. Enthusiasm has seemed to be on their side, especially in fundraising, but it's unclear if that energy will be enough to win districts that swung to Trump in 2016 or have traditionally favoured Republicans. One closely watched race is outside of Richmond, Virginia, where Republican Rep. Dave Brat, a one-time tea party favourite, is facing a stiff challenge from political newcomer Abigail Spanberger, a former CIA operative. Brat was campaigning over the weekend at the Innsbrook Pumpkin Palooza, pausing to watch a pumpkin catapult as he mingled with voters. Trump supporter Jen Dodge from nearby Glen Ellen said she's all for bringing more diversity to Congress. But as an employment recruiter, she said she also wants the best candidate for the job. And she said she appreciates what the president and the Republican Congress have done for the economy, especially by passing tax cuts. "We really need people in the Congress who are going to speak the best for the people," she said. Brat, she said, "does what he says he's going to do." "American people are frustrated," she said, recalling the protesters who confronted senators on Capitol Hill over Brett Kavanaugh's confirmation to the Supreme Court. "You shouldn't have to stand in an elevator and yell at your representative." The diversity gap between the parties has been growing since the civil rights battles of the 1960s, when white voters shifted toward Republicans and the party's support from African-Americans plummeted. Republicans set out to attract more votes from minorities and particularly Latinos after their election losses in 2012, but Trump turned that political strategy on its head in 2016, showing they could win by pulling white voters away from Democrats. Now the president's coalition is being put to the test. After conducting a poll of 72 competitive House districts, the Cook Political Report and LSU Manship School said this year's election "feels like 2010, in reverse." Almost half of Americans, 49 percent "feel frustrated" about Trump's presidency. That's the same share who said they felt frustrated about President Barack Obama during that year's midterm elections, when Democrats lost the majority in a wave election fuelled by conservative newcomers eager to confront the White House.